Combating apathy can be one of the most challenging aspects of leading or advising a student organization. 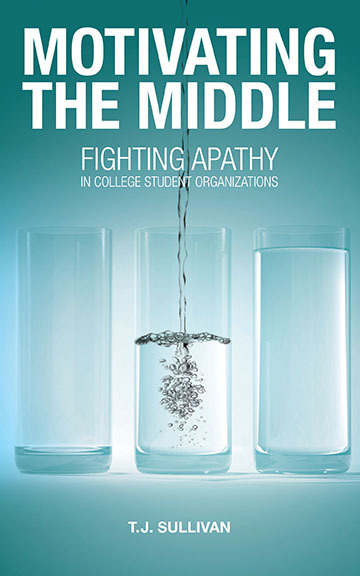 The book Motivating the Middle: Fighting Apathy in College Student Organizations by T. J. Sullivan aims to offer concrete solutions for this often reoccuring problem on our campuses. T.J.’s premise is that there are three different types of student organization members: the Top-Third; the Middle-Third; and the Bottom-Third. The “Top-Third” are your organization superstars that participate in everything and are high achievers. The “Bottom-Third” members, on the other hand, are those individuals who are doing the bare minimum, if that, in terms of organization involvement. T.J. suggests that student leaders concentrate on developing those “Middle-Third” members who are not the stellar achievers, but who do indeed participate and engage more than the “Bottom-Third” individuals. They may simply be involved in other activities, have other responsibilities, or just simply want to be involved under their own terms. By developing these particular members, the organization can benefit from increased participation and renewed vigor. The book is 64 pages in length and is easily readable in under an hour’s time. Where many student life leadership instructors miss the mark by offering theory-dense texts that may be largely academic and undigestible for student leaders, Motivating the Middle is a leadership resource that offers concrete solutions for solving organization member apathy. This book is not only appropriate for students, but for student life professionals as well. I highly recommend this book as a text for any type of leadership course your campus offers or as an appropriate resource to include during organization board training. The book is available for purchase on Amazon.com by clicking HERE. For bulk purchases of 20 or more books, contact T.J. Sullivan at sullivan@campuspeak.com and mention “StudentLifeGuru” to receive 20% off the list price. The first 50 people to share this post on Twitter by clicking below will be entered into a raffle to win a signed copy of T.J.’s book. This entry was posted on Friday, February 17th, 2012 at 12:15 am and is filed under Book Review, Leadership. You can follow any responses to this entry through the RSS 2.0 feed. You can leave a response, or trackback from your own site. You are more than welcome to share the blog. I just ask that you reference the blog if you are going to pull content from specific blog posts. Take care!